I've been told time and time again that who you marry is the second-most important decision you make in life, right after accepting Jesus Christ as your personal Savior. Woah, hey there, that's some kinda pressure! It stuns me to think of the responsibility and privilege and weight of being married. Godly marriage is one of the most beautiful, blessed things a person could ever enter into. It's holy. The idea is scary-as-all-get-out sometimes, too, if I'm being honest. It's not something I take lightly in the slightest. But I'm also just really excited about being a wife. I think it's going to be amazing, and a role and season of life that I am excited to embrace and explore. In light of all of this, out there in this great big crazy dating world, how does one sift through the possibilities to find the potential? I've done my fair share of sifting, and I've found a few non-negotiables for the man I marry. I thought I'd share with you a few of the things from MY "list" (as inspired by Ali and her list). 1.) A spiritual leader, willingly, unequivocally, and with my blessing (Ephesians 5:22-33): This has always been something I've struggled with. First off, I've seemed to always end up dating immature Christians. Secondly, it seems that oftentimes men are not taught what this looks like if it was lacking in their own home growing up. Thirdly, I'm pretty independent and a little bit (lot bit?) stubborn, so actually submitting and wholeheartedly accepting someone else as the spiritual leader has been difficult for me in the past. But this is non-negotiable, and requires work and commitment from both parties. 2.) Equally yoked (2 Corinthians 6:14): I used to think this just meant "don't marry an unbeliever" but now I have a more in-depth understanding of how God can create two people who are equally yoked in more ways that you can count or imagine. It's utterly beautiful. I spent a lot of time (and I mean A. LOT. of time) with my mom and best friend trying to figure out what sort of man/personality type would fit with me. I'm a pretty unique person/personality type, and I'm the first to admit I'm not always the easiest one to "get" right away. But the truth is, you don't need a "type" of man that would fit. You just need one. And God is faithful. 3.) 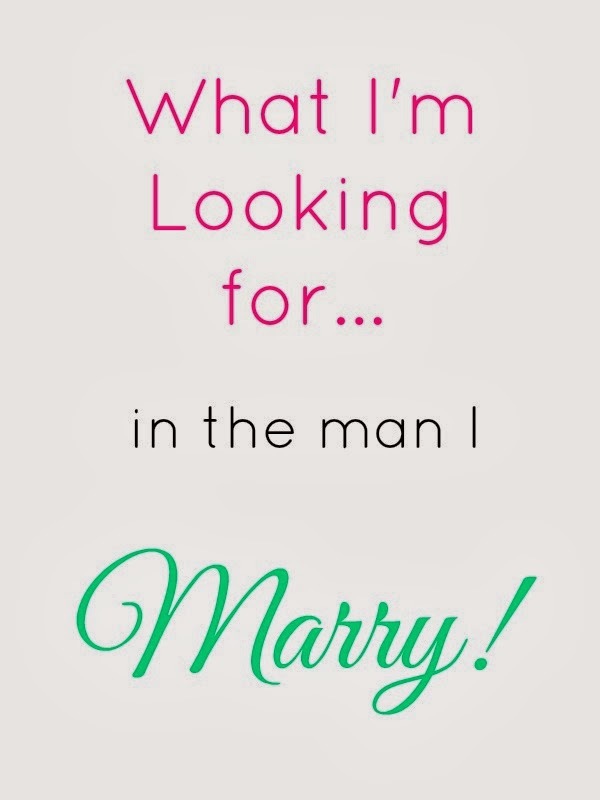 Someone who is in a place in life where they are ready to get married (1 Corinthians 13:11): I'm not looking for a boy. I'm looking for a man. I'm looking for someone who seeks to serve the Lord with his finances, his career, his relationships, and his whole heart. I've dated guys who weren't ready to get married and I've poured myself into them, tried to "love them" into growing up, etc. etc. Doesn't work, friends. Let's find men who are secure in Christ and secure in who they are BEFORE we show up on the scene. 5.) Someone who inspires me. (Ephesians 2:10). This might not be important for everyone, but for me, it is crucial. I've dated boys before with whom I never shared a word of my poetry with and never spilled a drop of ink about them onto the page. To me, that means they weren't bringing life out of me, or pouring life into me. My creative spirit and soul is one of the gifts God has given me, and I want a man who isn't afraid to engage that. This requires emotional intelligence, something that oftentimes men haven't exercised enough to fully develop. He needn't be interested in the exact same things I'm interested in or see the world through the exact same lenses I do. I'm looking for someone with the time and space in their life, heart, and mind to engage with my passions and their own. "I want a man who knows the value of a promise. Who keeps his promises.I want a man who believes that marriage is holy and is forever.I want a man who makes me absolutely a better version of myself (not just the other way around).I want a man who has both common sense and utter nonsense.I want a man who thinks I am cute when I make a few too many stupid jokes in a day, and when I laugh a little too loudly at something in my head.I want a man who will know when I'm in just a little too deep, and will give me that helping hand.I want a man who knows that occasionally I do get in a little too deep, but usually I am just fine.I want a man who is strong enough to be the spiritual leader for our family. And by that, I also mean, I want a man who wants a family and is a "family man". I want a man who loves me FOR my quirks, not in spite of them.I want a man who is able to see through me even when I just keep staring straight ahead.I want a man who appreciates the little things I choose, like nice towels and hand soaps; who knows exactly what I want, but surprises me still the same; who is okay with the fact that I am a major dork; who knows that I always want the honest answer even if I don't like it; who will like to cook with me; who will sleep out under the stars with me JUST because I *want* to." There are so many other things I could tell you I'm looking for. The little things. But when it comes right down to it, the truth of the matter is this: I'm looking for someone I CAN'T WAIT to do every day life with. Who can't wait to do every day life with me. I'm looking for the one God gives me. So...what's on your list? Am I way off track? Love, Love, Love this posting. I agree with you wholeheartedly. I might just do my own version of this. I'd encourage you to listen to Voddie Baucham and his messages on biblical manhood and womanhood if you haven't already! There were a couple of things on my sort of "list" from when I was a teenager that didn't end up mattering in the slightest. But some things really do matter--that he's interested in marriage, that he's willing to lead your family in following Christ are big ones, like you mentioned. Kindness and generosity were very big ones for me. I've known some stingy and unkind Christians in my day--both kindness and generosity are priorities for me and it's awesome to be with a guy who is truly generous.